O Donnellan and Joyce Auctioneers with joint agents Matt O Sullivan Auctioneer are delighted to offer for sale this superb two bedroom semi detached residence located at 100 Clifden Glen, Co. Galway. Clifden Glen is a unique holiday village offering in the capital of Connemara. The estate is comprised of a mixture of Lodges and Cottages. 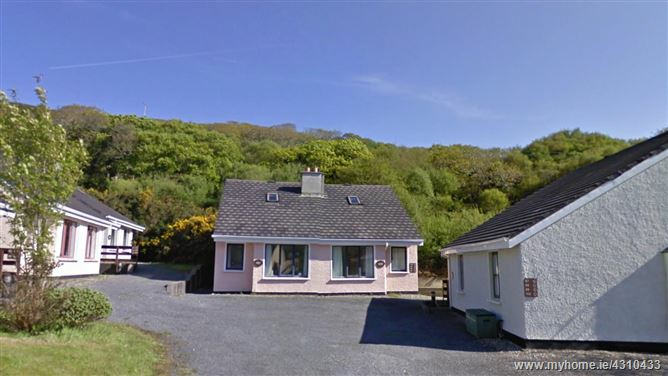 This picturesque holiday village is located 1.6 km from Clifden Town, making Clifden Glen the ideal base to explore Connemara and the West of Ireland, with Galway and Westport only a hour’s drive away. Clifden Town is a truly welcoming town, which boasts a superb selection of pubs, excellent restaurants and a cosmopolitan shopping experience with the best of Irish designers located at The Platform and many antique and interior design shops. By night Clifden comes alive with music and fun and Market Square is the perfect place to soak up the atmosphere. No 100 Cliften Glen is a wonderful residence presented in turn key condition throughout. The accommodation is comprised of a welcoming hall, an open plan kitchen, living & dining room, a double bedroom, utility room and main bathroom completes the accommodation no the ground floor. On the first floor the accommodation comprises of a large master bedroom with en suite bathroom and ample space for storage and a desk or seating area. 100 Clifden Glen is set on 192 acres of magnificent natural environment of mountain, meadow and river with spectacular views of of the renowned Connemara landscape. Facilities available at Clifden Glen include Club House Bar (open during Summer months), tennis courts, childrens playground and mini golf. This property would prove to be an ideal owner occupier residence or guilt edged investment property due to its convenient location, excellent condition and viewing is highly recommended and guaranteed not to disappoint. Semi solid wood floor throughout.